Howard Webb has provided a scan of this photo, showing Brent House, Upper Butts, New Brentford. The photo shows the part-completed demolition of the property. The original photo was sepia. 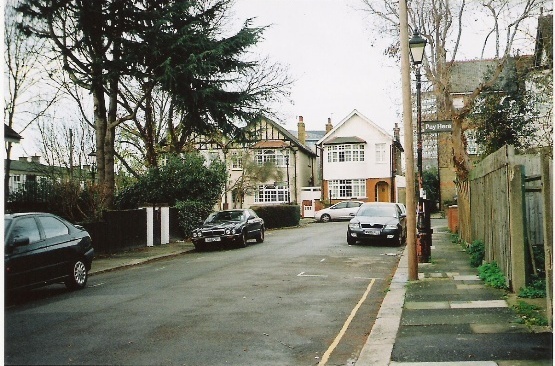 Janet McNamara has provided two modern (2011) views, the first with a similar vantage point to the 1909 photo, the second taken from further along Brent Road. So, exactly where was Brent House, when was it built, why was it demolished and how was it used? 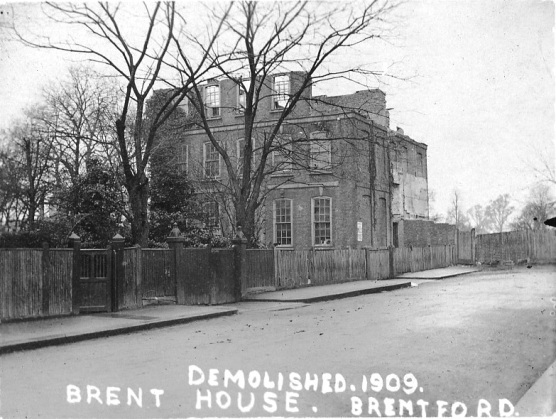 Brent House was built around 1694 on a site which today is on the corner of Upper Butts and Brent Road. It had a large garden which extended to the south east towards The Butts. Brent Road was not built at this time. Janet provided a map drawn in the 18th/early 19th century showing adjoining properties, Brent House and Brent Cottage, with Brent Cottage nearer to the River Brent, Brent House fronting Upper Butts. In 1838 Brent House and Brent Cottage were put up for sale, at which point they were part of the huge estate of William Crighton Esquire. The 1851 census includes Harriet C Ackland, Butts. She was 66, a widow and an annuitant, born London; female visitor Lucy Hooper and two live-in servants completed the household. In 1873 adverts were placed in the London Standard 'A limited number of Young LADIES RECEIVED, to whose care and instruction the Principals devotion...' suggesting Brent House was used as a school or college. The 1891 census shows William R Lacey living at Brent Cottage, he was a civil engineer and the father of Frederick William Lacey, surveyor to Brentford Local Board 1881-1888. Next door at Brent House lived Nicholas Luscombe, 'Steward of Club' and his wife Sarah A, 'Stewardess'. Kelly's Directory of Essex, Herts & Middx, 1894: Brentford Conservative Club (William Lewis, secretary), Brent House, The Butts. The 1894 OS map shows Brent Cottage and an adjoining 'Club' on the Upper Butts and Brent Road corner. Janet also remembered hearing of a Nell Gwyn connection. 'Brentford As It Was' (C34) and Fred Turner's 'History and Antiquities of Brentford' both include Fred Turner's photo of Brent House before its demolition. I think the 1909 photo was taken from Brent Road, Upper Butts not visible and was off to the right. 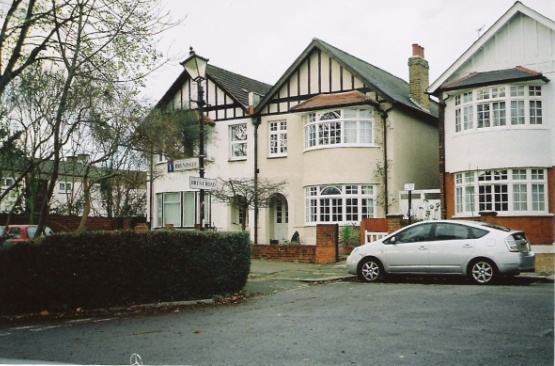 In 1918 Arthur Phillips, actor, lived at Brent Cottage with his wife Isabella Christie Laws. They stayed a few years; the London telephone directory for 1921 (found on the ancestry website) shows Joseph Charlton Lane-Claypon at this address and the same website includes electoral registers which show him here in 1922. A person of this name was 2nd Lieutenant in the Lincolnshire Regiment from 1914-1922 (The National Archives). Colonel George Francis Addison Cresswell' appointed his son-in-law Joseph Charlton Lane-Clayton, of Brent Cottage, Brentford as one of his executors. The will was written on March 1st 1924, suggesting JC L-C remained at this address then. The state was enormous: �108,653 2s 3d and the colonel was of Garden House, Hunstanton, Norfolk. Mrs Lane-Claypon of Brent Cottage, Brent-road, sought a girl to train as a betweenmaid, must be churchwoman; the wages were �16 (a year). Further adverts were placed in 1935 and 1936 and the 1936 electoral register shows Joseph Charlton and Priscilla Lane-Claypon at Brent Cottage. They moved away from Brentford within a few years and Priscilla died in 1939 at University College Hospital London, her will stating she was of Porch House, Farnham Royal, Slough; she pre-deceased her husband, who was a solicitor.